193 meters = height above sea level of DOX Gallery, Prague. The installation was created for a specific site: landlocked territory, DOX Gallery, borough of Holešovice, Prague, Czech Republic. The history of the borough of Holešovice is one linked with the city’s port, and to me the word DOX has always evoked docks. The installation revolves around the possibility of making one’s dreams or desires come true. Bohemia is a landlocked country, and so the sea is all the more strongly present in our imagination. The motif of the installation is that of a boat, which I see as a metaphor for life. “Brothels and colonies are two extreme types of heterotopia, and if we think, after all, that the boat is a floating piece of space, a place without a place, that exists by itself, that is closed in on itself and at the same time is given over to the infinity of the sea and that, from port to port, from tack to tack, from brothel to brothel, it goes as far as the colonies in search of the most precious treasures they conceal in their gardens, you will understand why the boat has not only been for our civilization, from the sixteenth century until the present, the great instrument of economic development (I have not been speaking of that today), but has been simultaneously the greatest reserve of the imagination. The ship is the heterotopia par excellence. In civilizations without boats, dreams dry up, espionage takes the place of adventure, and the police take the place of pirates“. 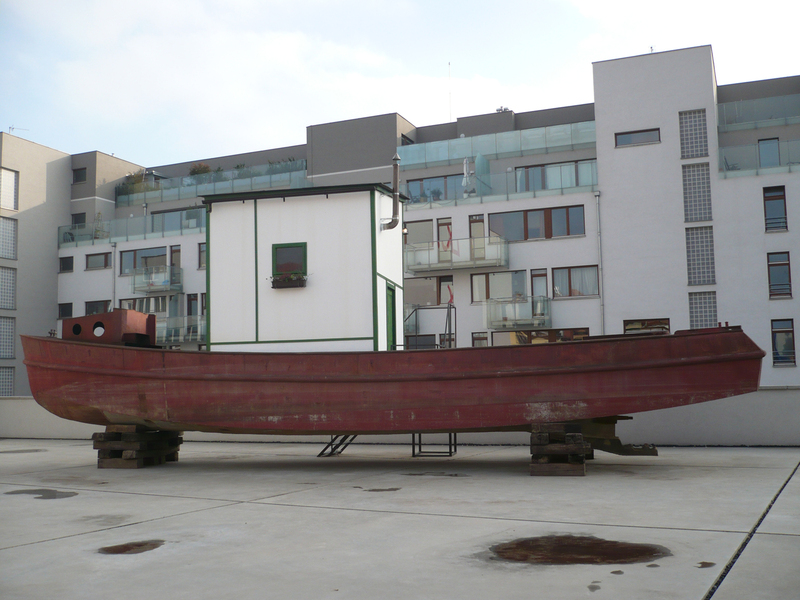 The boat, which I discovered in Prague’s Podolí neighborhood where I live, is originally from Hamburg, where it was used in the 1940s to transport sand. The boat is a reference to the horizon, it points towards the sea – a symbol of distance or unfulfilled desire. Where the sea is absent (as in the landlocked interior), this desire must be fulfilled with other, surrogate paradigms. One typical example of people realizing their dreams in a limited space is the culture of weekend cottages or cabins (known in Czech as “chata”). The “universal” weekend cabin on display represents not only this phenomenon, but also the more general human effort to control one’s surroundings, defining oneself in opposition to the world at large – in a sense, shutting oneself off from the world. That is why the cabin is of such an unusual DIY nature. With the weekend cabin incongruously placed on board, the boat brings to mind a shipwreck, long run aground in the sand, rusting, with nothing remaining but the yearning for lost distances. The absurdity of placing the boat on the gallery’s rooftop terrace also calls to mind the phenomenon of cosmic vessels appearing in the sky, cruising over the horizon. I have been collecting postcards with images of the sea for two years. Sent from the boundaries of the mainland into the landlocked interior, these picture postcards are photographic images that have engaged in the physical act of traveling. In framing them, I have hidden the postcards’ reverse side – their personal and literary side containing the name of the addressee, the message, and the time the card was written. The card could be from anywhere and anytime, somewhere on the seashore. It is a screen for projecting our imagination. The postcards have been installed in relation to cabin’s central space: on the left are postcards showing the left shore of the mainland, in the middle are views of the horizon, and on the right are images of the right shore. The theme of the horizon and all it can represent, a journey between times and spaces, is a recurring theme in my projects.